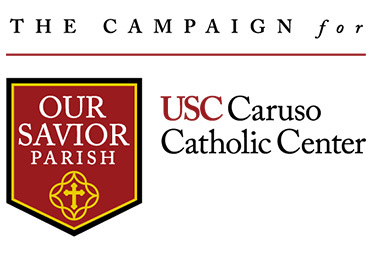 Each week, Our Savior Parish and USC Caruso Catholic Center welcomes nearly 1,100 students through its doors, inviting them into a relationship with Christ and equipping them with the tools to thrive as faith-filled agents of change. Students who come through the center leave feeling faithful, passionate, courageous, grateful and joyful. Our vision ensures that this Catholic oasis at USC will always be a place for those searching for answers, those seeking a deeper call of service, and those looking to form authentic, Christ-centered relationships. Consequently, it is essential that our ministry continue to reach new heights. This is why we have embarked on a $30 million comprehensive campaign. This campaign will ensure that the CCC has the resources to grow, to adapt, and to always be a “home away from home” for our Catholic Trojan Family. The need is great; the time is now. Join us! If you have questions about our campaign, please contact Brian Russell via email or at (310) 435-9561.